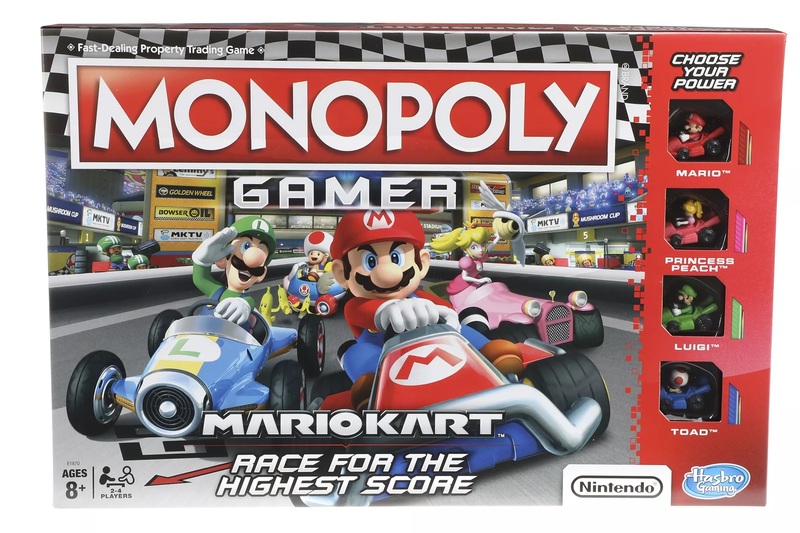 You may recall that, last year, Hasbro came out with Monopoly Gamer Edition featuring Super Mario. The company has now revealed Monopoly Gamer: Mario Kart Edition, and it’s out today. In Monopoly Gamer: Mario Kart Edition, a race starts when players pass “Go”. Here players compete for a Grand Prix card. Monopoly Gamer: Mario Kart Edition also features properties from the karting franchise such as Rainbow Road and Bowser’s Castle. Mario Kart items like shells and banana peels can also be used. Monopoly Gamer: Mario Kart Edition will offer Mario, Princess Peach, Luigi, and Toad as playable characters at launch. A “Power Pack”, slated for this fall, will include Bowser, Rosalina, Shy Guy, Metal Mario, Donkey Kong, and Yoshi as playable characters. You can purchase Monopoly Gamer: Mario Kart Edition at GameStop starting today for $29.99 (available here, Figure Packs are also here). It’ll also be sold at other retailers this summer.